Pitchify is a toolkit comprising 6 story-element sheets and a set of cards. It is developed to support analyzing and preparing for design pitches through storytelling. You can download it from the website for free. The role of design shifts from designing objects towards designing for experiences. The design profession has to follow this trend but the current skill-set of designers focuses mainly on objects; their form, function, manufacturing and interaction. However, contemporary methods and tools that support the designers’ creative efforts provide little help in addressing the subjective, context-dependent and temporal nature of experiences. Designers hence need to learn by trial and error how to place experiences at the center of their creative intentions. We are convinced that there is room for new tools and methods that can assist them in this process. We believe that storycraft can offer part of the guidance that designers require to put experiences before products right from the very start of the design process. Sketchify is a toolset for sketching of novel classes of user interfaces, which we use in education of interaction designers. With Sketchify, we extend the concept of paper and pencil sketching to a more generic concept ofrapid manipulation of interaction material. We define Interactive material as any piece of software/hardware that represents or simulates a part of user interactive experiences, such as inputs from sensors, output of audio tools, interaction with Web services, or simple drawings. 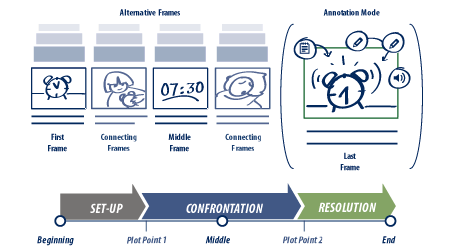 Through manipulation of interactive materials, designers create “interactive sketches”, which in rough terms illustrate interaction scenario or interaction techniques. Our tool gives a designer freedom to combine elements of traditional freehand sketching and with numerous extensions, such as end-user programming (spreadsheets and scripts), and links to existing software functionality. Sketchify build on the results of the Adaptable Multi-Interface Communicator (AMICO) project. The main objective when creating the Design TeamMate was to create an integrated platform on which important design activities such as collecting and browsing information, building and presenting storyboards and moodboards, and many others, can be carried out. The targeted users constitute a team of up to four, possibly multi-disciplinary, designers. Our primary goal was to move beyond a laboratory prototype, and to create a system that was aesthetically pleasing, next to being functional and easy to use. Especially the ability to move fluently between different activities was an essential design requirement. This thesis of Andres Lucero explored why and how designers use mood boards in the early stages of the design process, and how augmented reality can support mood boarding by following a user-centered design approach. The main research questions in his thesis were: 1) what are MBs and why do designers use them, and 2) how can AR tools provide support for professional users in their work. Mood boarding was explored in depth by means of interviews with Dutch and Finnish practicing designers. The knowledge gained in these interviews was fed into co-design sessions with Dutch and Finnish designers in which researchers and end-users (i.e. designers) created augmented reality tools that support mood boarding. This thesis of Dzmitry Aliakseyeu explored how a computer support tool for the early stages of architectural design could be designed, implemented and validated. Because of the complexity and vagueness of the early design stage it was difficult to derive a priori how such tools should behave in detail, especially since this was the very first project we did in this area. In order to learn about the detailed requirements experiments with increasingly complex prototypes were carried out. This iterative prototyping approach resulted in the Electronic Paper prototype, extensively described in: D. Aliakseyeu, J.B. Martens, M. Rauterberg, “A Computer Support Tool for the Early Stages of Architectural Design”, Interacting with Computers 18, p. 528-555, 2006.